Objectives The aim of this systematic review was to examine the epidemiology of malpractice claims in primary care. Design A computerised systematic literature search was conducted. Studies were included if they reported original data (≥10 cases) pertinent to malpractice claims, were based in primary care and were published in the English language. Data were synthesised using a narrative approach. Primary outcome Malpractice claim (defined as a written demand for compensation for medical injury). We recorded: medical misadventure cited in claims, missed/delayed diagnoses cited in claims, outcome of claims, prevalence of claims and compensation awarded to claimants. Results Of the 7152 articles retrieved by electronic search, a total of 34 studies met the inclusion criteria and were included in the narrative analysis. Twenty-eight studies presented data from medical indemnity malpractice claims databases and six studies presented survey data. Fifteen studies were based in the USA, nine in the UK, seven in Australia, one in Canada and two in France. The commonest medical misadventure resulting in claims was failure to or delay in diagnosis, which represented 26–63% of all claims across included studies. Common missed or delayed diagnoses included cancer and myocardial infarction in adults and meningitis in children. Medication error represented the second commonest domain representing 5.6–20% of all claims across included studies. The prevalence of malpractice claims in primary care varied across countries. In the USA and Australia when compared with other clinical disciplines, general practice ranked in the top five specialties accounting for the most claims, representing 7.6–20% of all claims. However, the majority of claims were successfully defended. Conclusions This review of malpractice claims in primary care highlights diagnosis and medication error as areas to be prioritised in developing educational strategies and risk management systems. Malpractice risk in primary care is understudied. An awareness of the epidemiology of malpractice claims in primary care could help inform risk management and educational strategies. Failure to or delay in diagnosis was the commonest misadventure cited in malpractice claims. The diagnoses most frequently cited in claims for adults were cancer and myocardial infarction and for children, meningitis. Medication error was the second commonest reason for claims in primary care. 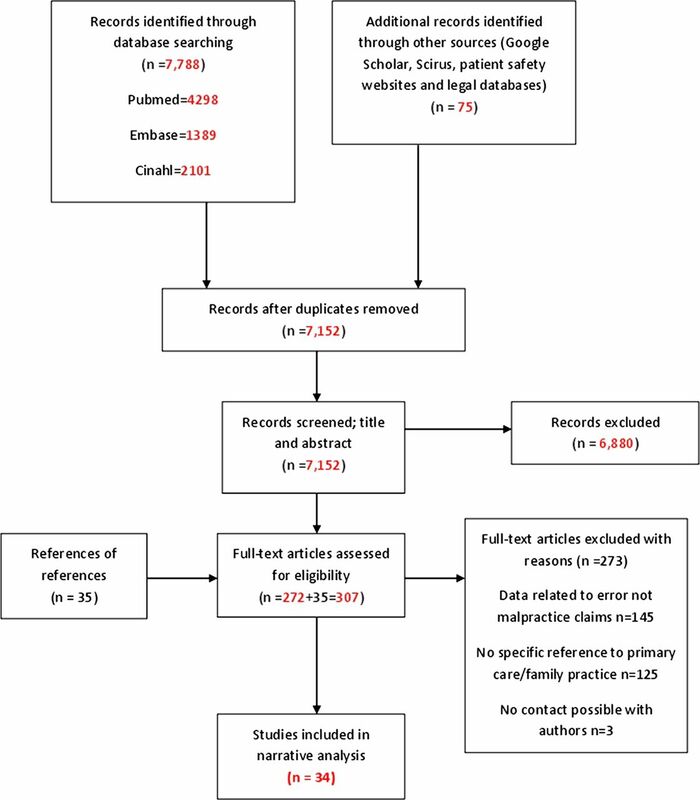 Timely systematic review considering the increased focus on adverse events in primary care. Difficult to generalise findings considering the variation in the definition of primary care across countries and differences in clinical and legal systems. Limited to publications in English only. The aim of this systematic review was to examine the epidemiology of malpractice claims in primary care. The PRISMA guidelines for the reporting and conduct of systematic reviews were followed to conduct this review.14 A computerised literature search was conducted in April 2012 and updated in January 2013 using the following search engines: PubMed, EMBASE, CINAHL, Cochrane library, Google scholar, Scirus and legal databases (Heinonline, Justis, Lexisnexis and Westlaw). The search strategy details are provided in detail in online supplementary appendix 1. Study type: studies presenting original data (≥10 cases) on malpractice claims. Studies relating to complaints that did not result in a malpractice claim were excluded. Studies focusing on outpatient or paediatric malpractice claims were included only if data specific to primary care were reported. Outcome: malpractice claim; defined as a written demand for compensation for medical injury. Two reviewers (EW and JL) read the titles and/or abstracts of the records and eliminated irrelevant studies. Studies that were considered eligible for inclusion were read fully in duplicate and their suitability for inclusion in the study was independently determined by both reviewers. Disagreements were managed by consensus. Additional data were sought from authors and medical indemnity organisations where necessary. Data were extracted on each of the following: (1) study setting, (2) population studied, (3) type of data (eg, medical indemnity database, survey, etc), (4) prevalence of malpractice claims, (5) medical misadventure cited in claims, (6) types of missed/delayed diagnoses, (7) claims outcomes and (8) compensation awarded to claimants. A flow diagram of the search strategy is presented in figure 1. This yielded 7152 articles of which 6880 were excluded based on their title and/or abstract. The remaining 307 articles were assessed in full text. A total of 34 studies met the inclusion criteria and were included in the narrative analysis. PRISMA flow diagram of search strategy. Of a total of 34 included studies, 28 presented data from retrospective reviews of medical liability insurance databases ranging in terms of numbers included from 20 to 49 345 malpractice claims (see online supplementary table S1). The remaining six studies presented survey data (see table 1). Fifteen studies were based in the USA, nine in the UK, seven in Australia, one in Canada and two in France. A description of the included named malpractice claims databases is presented in table 2. A total of 19 studies reported either (1) malpractice claim prevalence rates or (2) the proportion of primary care claims as a percentage of all specialty claims on medical indemnity databases during specified time periods. Of these studies, 11 were based in the USA, four in Australia, three in the UK and one in France. In the USA, the annual prevalence of malpractice claims against family practitioners appears to have remained relatively stable over the past two decades. When compared with other specialties, family practice is consistently ranked in the top five most sued specialties on US medical indemnity databases.25–28 ,30 This review also indicates that, in the UK and Australia, malpractice claims against GPs are rising. Importantly, the majority of malpractice claims are successfully defended with approximately one-third of US and one-half of UK GP claims resulting in payment to the claimant. Diagnostic error accounts for the majority of malpractice claims in primary care and the commonest cited missed or delayed diagnoses, for adults, are cancer and myocardial infarction and for children, meningitis. While we acknowledge the limitations of malpractice claims as a proxy for adverse events, it is interesting to note that this finding is congruent with the findings of a review of error in primary care.2 The need to focus on diagnosis while developing quality frameworks has recently been highlighted.46 Diagnostic error may result as a result of faulty clinical reasoning, misinterpretation of diagnostic tests or be related to or exacerbated by system failures and is often multifactorial.47 When we examine in more detail the cognitive processes underlying faulty clinical decision-making, shortcuts in reasoning (heuristics) emerges as an important entity.48 A recent systematic review which focused on common misdiagnoses in primary care suggested that GPs misattributing presenting symptoms and signs to an obvious or readily available diagnosis may be a key issue.49 This process is known as availability heuristics. Estimating the likelihood of a diagnosis with ease of recall is more convenient and often appropriate as familiar diagnoses tend to be those commonly encountered but can lead to error when significant disease is the underlying reason for the encounter. Another issue is that of ‘anchoring heuristics’, which occurs when doctors tend to maintain initial impressions once they are solidly formed. An existing diagnostic label can reduce the clinician's ability to restructure the diagnostic problem and look for an alternative explanation. In primary care where there is a lower prevalence of serious disease, a doctor's ability to formulate an appropriate differential diagnosis list, gather information to test these diagnostic hypotheses and then accept or reject diagnoses based on this appears to be of key importance.50 Medical schools, general practice training programmes and continuing professional development facilitators all have roles to play in ensuring that curricula focuses trainees and practitioners on understanding the nature and psychology of diagnostic error. Medication error represents the second commonest cause of malpractice claims in this review. A recent UK qualitative study which interviewed 34 prescribers regarding 70 medication errors found that errors were often multifactorial with prescriber, patient and system factors all being contributors.51 For the prescriber, the areas highlighted included their therapeutic training, drug knowledge and experience, knowledge of the patient, perception of risk and emotional health. Many of those interviewed felt that their undergraduate prescribing training was inadequate. From a patient perspective, the complexity of the presentation and patient characteristics such as language barriers were highlighted as important factors. From a systems perspective, poor communication, high workload and time pressures were all felt to contribute to medication error. Strategies to reduce medication error therefore should focus on the clinician, patient and system factors. This review is timely considering the increasing interest in focusing on primary care as a way of improving patient safety. There are, however, several limitations. First, it is difficult to generalise results across countries. In the USA, the term ‘primary care’ often includes internal medicine, general paediatrics and family practice, while in the UK the term is more specific to general practice. Second, while every attempt has been made to be systematic in undertaking this review, the nature of this topic means that many publications appear in the grey literature, making it difficult to be certain that all studies of interest have been captured. Third, as previously outlined, there are well-recognised limitations to using malpractice claims data as a proxy for the totality of adverse events in clinical practice. Finally, this review was limited to publications published in English only and the majority of included studies were from the USA, the UK and Australia, making it difficult to draw country-specific conclusions for other countries such as Canada and France. The increasing recognition of primary care as a setting for adverse events places the development of fit-for-purpose educational strategies and risk management systems as a priority for those interested in promoting patient safety. This review offers insights into the epidemiology of malpractice claims in this setting and highlights areas that could be prioritised both for future research and in the development of risk management systems. The authors would like to thank Dr Paul Nisselle and the Medical Protection Society, UK, Anupam B Jena, MD, PhD, Assistant Professor of Health Care Policy and Medicine, Harvard Medical School, Boston, USA and Dr Gordon Wallace and the Canadian Medical Protective Association (CMPA), Canada for providing additional data for this article.
. The frequency and nature of medical error in primary care: understanding the diversity across studies. Fam Pract 2003;20:231–6.
. Errors and adverse events in family medicine: developing and validating a Canadian taxonomy of errors. Can Fam Physician 2007;53:271–6, 0.
. Learning from litigation. The role of claims analysis in patient safety. J Eval Clin Pract 2006;12:665–74.
. Learning from litigation: an analysis of claims for clinical negligence. Manchester: University of Manchester, 2004.
. Learning from primary care malpractice: past, present and future. Qual Saf Health Care 2004;13:90–1.
. The American Society of Anesthesiologists closed claims project: the beginning. Anesthesiology 2010;113:957–60.
. Analysis of surgical errors in closed malpractice claims at 4 liability insurers. Surgery 2006;140:25–33.
. An analysis of successful litigation claims in children in England. Arch Dis Child 2011;96:838–40.
. Sued for misdiagnosis? It could happen to you. J Fam Pract 2010;59:498–508.
. Malpractice risk in ambulatory settings: an increasing and underrecognized problem. JAMA 2011;305:2464–5. , et al, eds. Primary care: America's health in a new era. Washington, DC: National Academy Press, 1996.
. Guidance on the conduct of narrative synthesis in systematic reviews. Lancaster: Institute of Health Research, ESRC Methods Programme, 2006.
. Electronic health records and malpractice claims in office practice. Arch Intern Med 2008;168:2362–7.
. Medical malpractice: claims, legal costs, and the practice of defensive medicine. Health Aff (Millwood) 1984;3:128–33.
. Changing medical practice and medical malpractice claims. Soc Probl 1995;42:38–55. Medical Protection Society. More than two thirds of doctors practice defensively to avoid complaints and claims. Press release 2011.
. Policy research perspectives—medical liability claim frequency: a 2007–2008 snapshot of physicians. Chicago: American Medical Association, 2010.
. Epidemiology and aetiology of paediatric malpractice claims in France. Arch Dis Child 2011;96:127–30.
. Characteristics of medical professional liability claims in patients treated by family medicine physicians. J Am Board Fam Med 2010;23:753–61.
. Claims, errors, and compensation payments in medical malpractice litigation. N Engl J Med 2006;354:2024–33.
. Do health system errors cause medical malpractice claims. Napa: The Doctors Company, 2008.
. Use of the Physician Insurers Association of America database as a surveillance tool for diabetes-related malpractice claims in the U.S. Diabetes Care 1998;21:1096–100.
. Epidemiology of malpractice lawsuits in paediatrics. Acta Paediatr 2008;97:1486–91.
. Omission-related malpractice claims and the limits of defensive medicine. Med Care Res Rev 1997;54:456–71.
. On average, physicians spend nearly 11 percent of their 40-year careers with an open, unresolved malpractice claim. Health Aff (Millwood) 2013;32:111–19. Medical Defence Union (MDU). ‘GP claims increase by 20%’. Press release. 2011.
. An analysis of 1000 consecutive general practice negligence claims. Medical Protection Society (MPS), 2000. Australian Institute of Health and Welfare. Public and Private sector medical indemnity claims in Australia. http://www.aihw.gov.au/search/?q=medical+indemnity+claims (accessed 13 Dec 2012). Canadian Medical Protective Association (CMPA). Critical incident groupings,family, practitioner settlement cases, CMPA 2005–2009. Courtesy of the Research Department, Canadian Medical Protective Association.
. The epidemiology of error: an analysis of databases of clinical negligence litigation. University of Manchester, Manchester, 2004.
. Case studies in litigation: claims reviews in four specialties. University of Manchester, Manchester, 2004. Medical Protection Society (MPS). The GP compass: navigating your way to safer practice. London: MPS, 2011.
. Learning from litigation. Meningitis and septicaemia in children. Medical Protection Society, 2012. (Unpublished personal communication).
. Analysis of medication-related malpractice claims: causes, preventability, and costs. Arch Intern Med 2002;162:2414–20. Medical Protection Society (MPS). Medication claims review. Courtesy of the Risk Management department of the MPS. 2012.
. When tort resolutions are wrong: predictors of discordant outcomes in medical malpractice litigation. J Legal Stud 2007;36:S47–78.
. Learning from clinical claims in primary care. Medical Protection Society (MPS) Casebook. 2011 September 2011:7–9.
. Improving patient care. The cognitive psychology of missed diagnoses. Ann Intern Med 2005;142:115–20.
. Investigating the prevalence and causes of prescribing errors in general practice: Report for the General Medical Council (GMC); May 2012.
. GPs’ concerns about medicolegal issues—how it affects their practice. Aust Fam Physician 2009;38:66–70.
. Effects of the medical liability system in Australia, the UK, and the USA. Lancet 2006;368:240–6.
. Perceived practice change in Australian doctors as a result of medicolegal concerns. Med J Aust 2010;193:579–83. Contributors EW participated in protocol development, literature searching, data extraction, data analysis and manuscript preparation. JL participated in protocol development, literature searching, data extraction and manuscript preparation, SMS participated in protocol development, data analysis and manuscript preparation, TF participated in protocol development, data analysis and manuscript preparation. All authors have read and approved the final manuscript. Funding This work is supported by the Health Research Board (HRB) of Ireland through the HRB Centre for Primary Care Research under Grant HRC/2007/1. Data sharing statement Unpublished data from the Medical Protection Society, UK are available from Dr Paul Nisselle, Senior Consultant, Educational Services, MPS. paul.nisselle@mps.org.uk. Unpublished data from the Canadian Medical Protective Association (CMPA) are available from Dr Gordan Wallace, Director of Education, CMPA. gwallace@cmpa.org. Additional data for Jena, 2011 are available from Professor Jena, Department of Healthcare Policy, Harvard. jena@hcp.med.harvard.edu.